The official story tells us American Airlines Flight 77 was hijacked at 8:51 (5 minutes after the first WTC strike) and, piloted by terrorist Hani Hanjour, flew without being intercepted for 45 minutes. 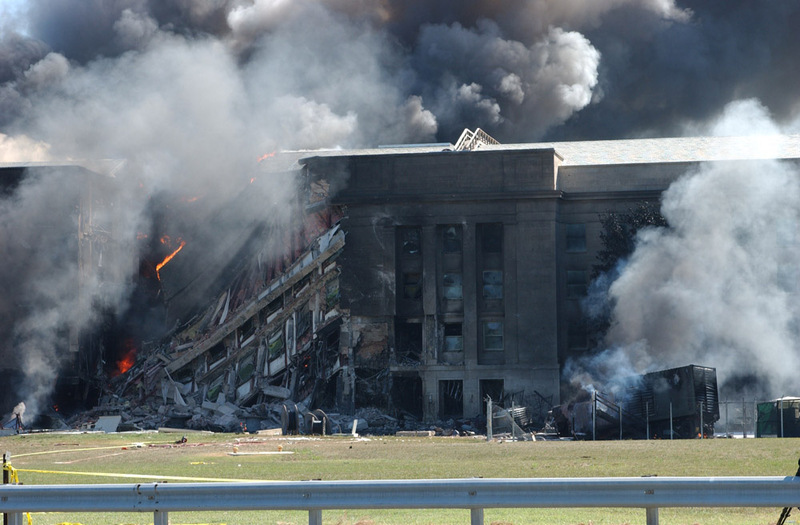 Over the Pentagon, it pulled a high-speed 330-degree turn before knocking over five light poles, accelerating to 853 km/h, skimming above the Pentagon lawn to strike into the first floor of the building at 09:37. 64 died on the plane, 125 in the Pentagon. "I have 6,000 hours of flight time in Boeing 757s and 767s and I could not have flown it the way the flight path was described... Something stinks to high heaven!" Newspaper articles quote Hanjour's flight instructors saying he "could not fly at all" and was "a terrible pilot." In the summer of 2001, a New Jersey flight instructor "declined a second request" to take the alleged would-be hijacker in on a small-plane flight "because of what he considered Hanjour's poor piloting skills." Although the Pentagon was arguably the most secure building in the world, this is the only publicly available footage of the alleged crash of Flight 77, released almost five years after the incident in May 2006. (A second camera right next to this one captured nearly identical footage that was also released). This footage does not prove that a plane hit the building. 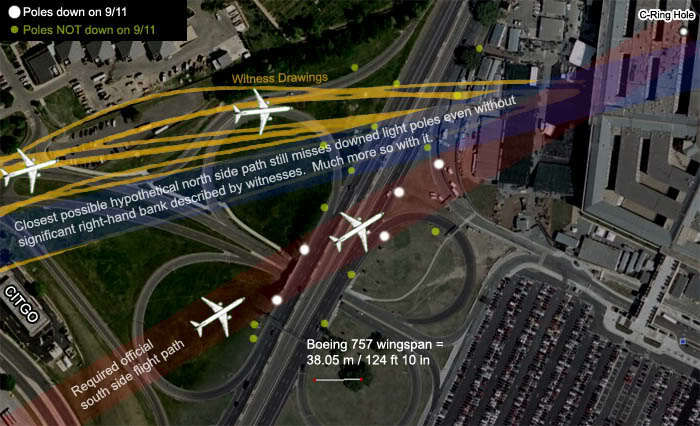 "From my close-up inspection, there's no evidence of a plane having crashed anywhere near the Pentagon... The only pieces left that you can see are small enough that you could pick up in your hand. There are no large tail sections, wing sections, fuselage, nothing like that anywhere around which would indicate that the entire plane crashed into the side of the Pentagon..."
"didn't see any evidence of metal, airplane seats, no luggage. Nothing that would give me any indication that it was a plane that had hit the building... 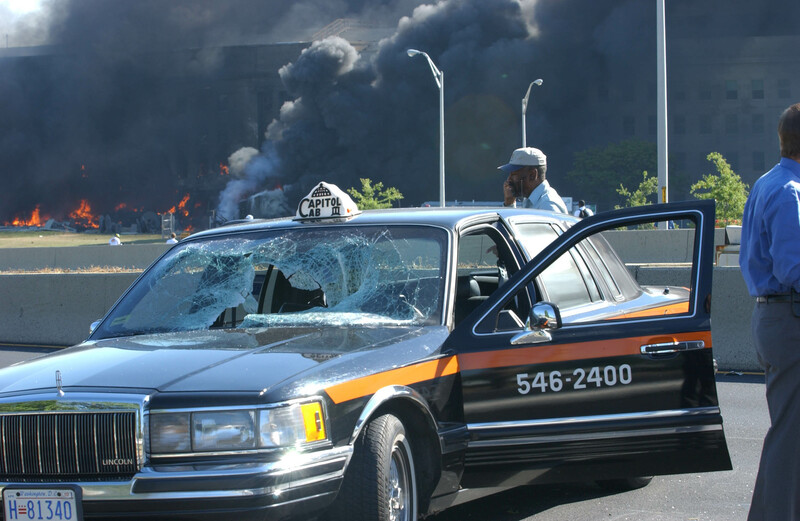 There was nothing on the inside that would give me any indication that there was a plane." "I'm looking for wreckage, and I don't see anything discernible. I can't find a piece of anything that I recognize. I can't see the tail, I can't see the wheels, I can't see the engines, there's no chairs, there's no luggage, there's no logo..."
"I've never seen what the pictures looked like... The FBI was here within minutes and took the film." Alternately described in official government accounts as being created by the nose of the plane or the landing gear, this large round hole was located on the inside of the Pentagon's C-ring, several layers inward from the outer wall. Is this plausible? What really caused this? Why would the terrorists strike Wedge 1 of the Pentagon? The section directly opposite would have been a much richer target and easier to approach. It was public knowledge that the Defense Secretary's office and the office of the Chairman of the Joint Chiefs of Staff and those of other top-ranking officers, were located on the opposite side of the explosion zone. a portion of the building that had already been renovated. 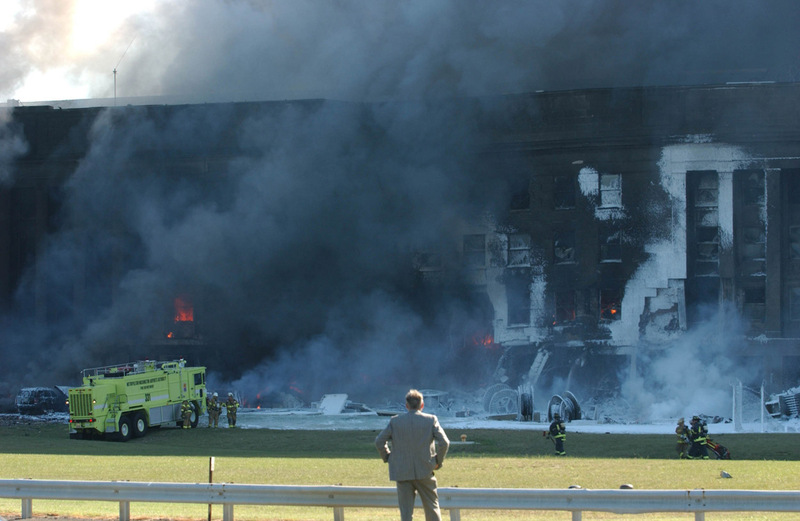 It was the only area of the Pentagon with a sprinkler system, and it had been reconstructed with a web of steel columns and bars to withstand bomb blasts. 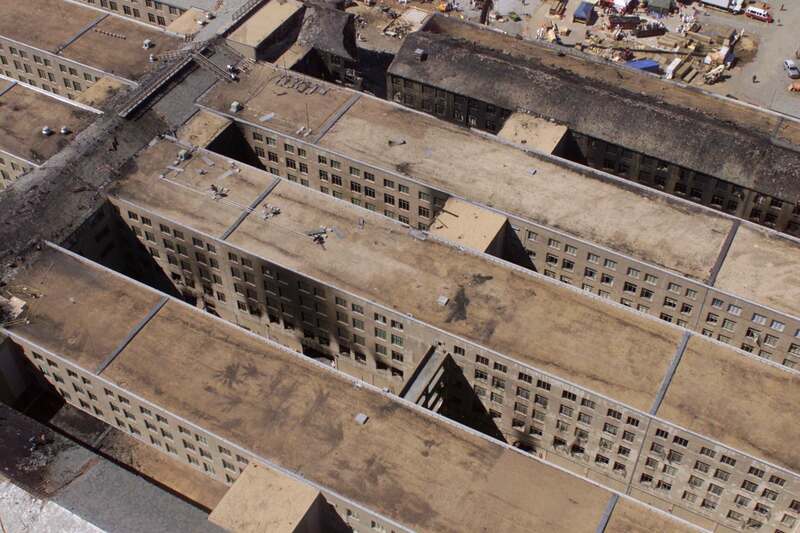 The steel reinforcement, bolted together to form a continuous structure through all of the Pentagon's five floors, kept that section of the building from collapsing for 30 minutes--enough time for hundreds of people to crawl out to safety. The area struck by the plane also had blast-resistant windows--2 inches thick and 2,500 pounds each--that stayed intact during the crash and fire. 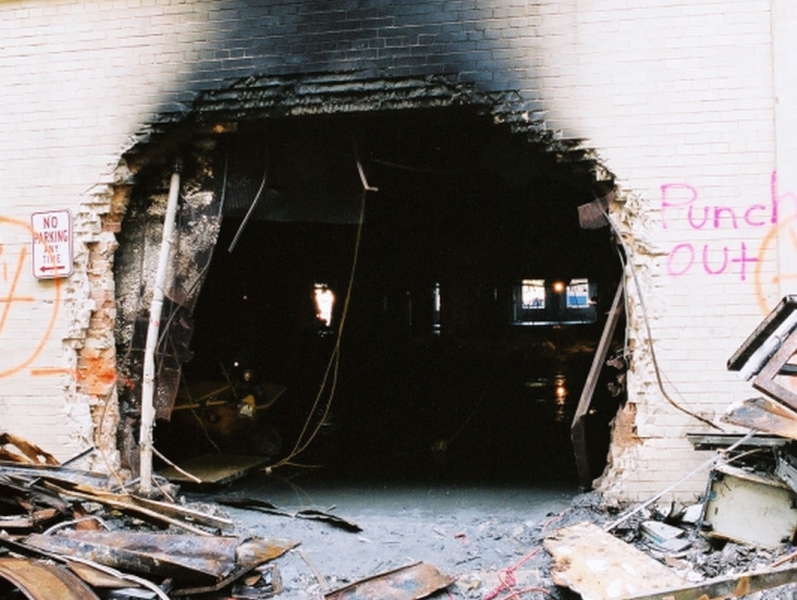 It had fire doors that opened automatically and newly built exits that allowed people to get out... While perhaps 4,500 people normally would have been working in the hardest-hit areas, because of the renovation work only about 800 were there Tuesday, officials said. Is this the spot terrorists would have chosen to strike? With a series of straightforward interviews with 13 independent eyewitnesses of the low-flying plane at the Pentagon on 9/11, who are certain about what they saw, Citizen Investigation Team demonstrates that the government's oft-repeated official story of a southern Flight 77 approach was impossible. All 13 witnesses -- including two police officers -- are sure the plane flew directly over the Navy Annex and North of the CITGO gas station. 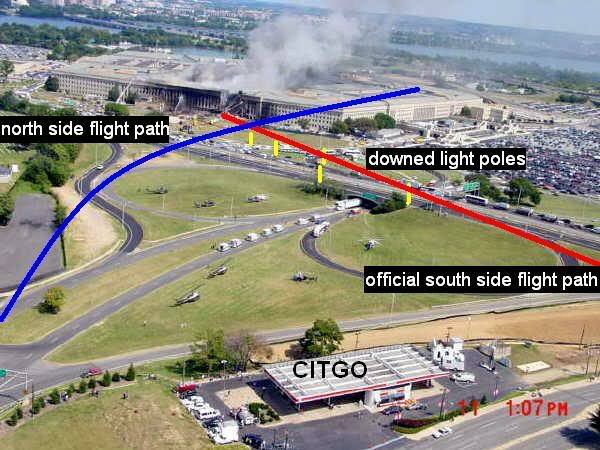 This suggests the official flight path is false, and the knocked over light poles on the bridge south of the Pentagon and the path of internal damage were staged. "This is too big for me, man. This is a big thing... I'm not supposed to be involved in this. This is for other people. People who have money... It was planned." Transportation Secretary Norman Mineta testified to the 9/11 Commission about his experience in the Presidential Emergency Operations Center (PEOC) bunker under the White House on 9/11. Mineta said he arrived in the PEOC bunker at 9:20, and Vice President Cheney was already there at that time. The 9/11 Commission Report ignored Mineta's testimony and wrote that Cheney arrived 38 minutes later at 9:58 (and thus AFTER the Pentagon attack). Multiple others have also made statements suggesting Cheney was in the bunker earlier. Were they talking about a stand-down order telling the fighters or anti-air not to engage? Or was it an order to shoot a missile at the very section of the pentagon housing the ONI accountants investigating past Bush administration financial crimes? At the very least, while the 9/11 Commission Report attempts to paint a false narrative suggesting US leadership was unaware, confused, and unable to make decisions in time that morning, the facts show they had significantly more knowledge and control than is admitted. Video of Mineta's testimony was originally available on the 9/11 Commission website, but it was removed. When questioned about this the National Archive said it must have been lost in a "snafu." It has since been recovered and is now widely available on the internet.